This project was a consultancy for DMITRE regarding the forecasting and value proposition for including a dedicated hub of collaboration and innovation at the Tonsley redevelopment site (the former Mitsubishi car assembly plant), just south of Adelaide. The South Australian economy has a strong manufacturing base that is in the process of transition. Tonsley is a key platform for the transformation of manufacturing in South Australia from mass produced, non-specialised products to high technology, specialised products and knowledge services that can compete in a high cost environment. Historically, the Tonsley site offered an anchor for the manufacturing industry through being established as a car manufacturing site for Mitsubishi. As the industry matures from mass produced products to focusing on knowledge intensive services, the revitalisation of Tonsley towards high value manufacturing, and as an innovation catalyst, presents a unique opportunity. 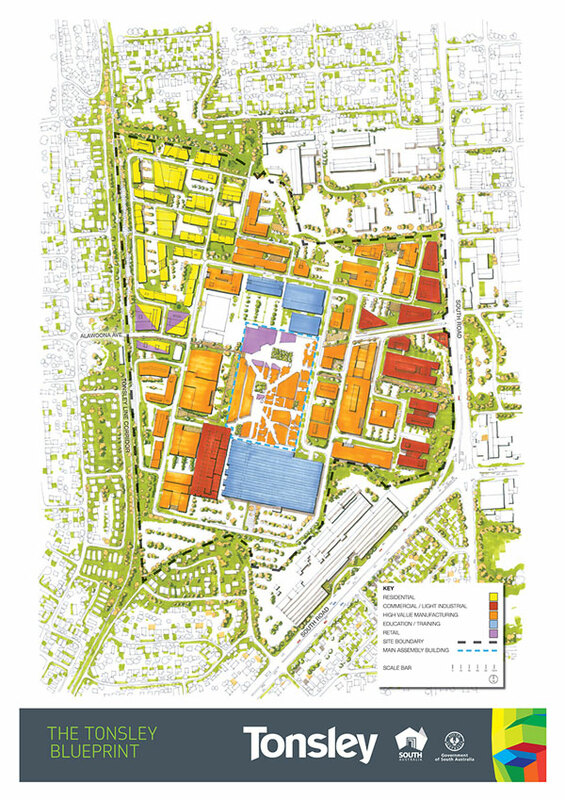 The Tonsley site offers a world-class design of an exceptional physical environment, and will be host to a mix of on-site operators across a spectrum from education, government, business and community. Each brings unique experience, knowledge and skill sets. This project used the technique of forecasting a narrative of how the future at Tonsley could be, if it explored the benefits of including a physical hub on-site dedicated to nurturing innovation by connecting people, providing opportunities to interact, collaborate and gain knowledge – more important than ever with the shift in focus to knowledge services. This approach would support higher levels of innovation, business growth and accelerated industry development to unleash transformational potential. A forecast scenario was developed to demonstrate how a careful strategy of coordinated programs could ensure that such a hub could nurture young businesses, and catalyse opportunities for collaboration, knowledge exchange, interaction, and innovation amongst industry and workers, whilst also engaging students, visitors and residents. The strategic forecast included a theory of change, explaining the conditions required for incubation of talent and knowledge exchange. This included what to put into place and in what order, which partners would be essential to the process at particular stages, and what they would need to offer.